OSU’s Agricultural & Resource Law Program is pleased to announce its inaugural webinar, Big Data and UAVs: Legal Issues for Agriculture, scheduled for Friday, December 12 at 1 pm. This is the first webinar in the program’s new “Ohio Food, Agriculture and Environmental Law Webinar Series,” offering monthly legal webinars on issues of importance to Ohio agriculture. The webinar will feature John Dillard, an Associate Attorney with the law firm of Olsson Frank Weeda Terman Matz, PC in Washington, DC and a leading expert on legal issues with technology and agriculture. With a background in agriculture and experience advising clients in the food and agricultural industries, Dillard will present a practical analysis of the legal issues raised by agriculture’s increasing use of large data sources and UAVs. Dillard authors a blog, Ag in the Courtroom, on AgWeb.com and Legal Ease, a column in Farm Journal magazine. He has appeared on national television and radio agricultural programs to discuss legal issues that affect agriculture. The 2014 Farm Bill: Guiding a Client through the New Law with Bill Bridgforth of Ramsay, Bridgforth, Robinson & Raley LLP, Pine Bluff, Arkansas on Friday, January 9, 2015 at 1 pm. Managing Pollutant Discharge Risk on Farms with Chris Walker and Jack Van Kley of Van Kley & Walker LLP, Dayton/Columbus, Ohio and Tom Mehnke of Mehnke Consulting LLC, Greenville, Ohio on Thursday, February 12, 2015 at 1 pm (tentative). Introduction to Food Law: What You Need to Know to Build a Food Law Practice with Jason Foscolo of Foscolo & Handel PLLC, Sag Harbor, New York on Thursday, March 12, 2015 at 1 pm. Nursing Home Costs & Medicaid: The One-Two Punch to the Family Farm with Craig Vandervoort of Sitterly & Vandervoort Ltd, Lancaster, Ohio on Friday, April 10, 2015 at 1 pm. Rights and Remedies for Protecting Your Water Supply in Ohio with Joe Reidy of Frost Brown Todd LLC, Columbus, Ohio and Peggy Kirk Hall of OSU’s Agricultural & Resource Law Program on Thursday, May 14, 2015 (tentative). For information on how to access the complimentary webinars and archived recordings, visit the “webinars” tab on https://farmoffice.osu.edu. Ohio State University Extension’s Agricultural & Resource Law Program will host the Sixth Annual Ohio Agricultural Law Conference on Friday May 16, 2014 at the Ohio 4-H Center. This year’s program features OSU’s Dr. Carl Zulauf discussing the new Farm Bill. Also on the schedule is a legislative update from Ohio Farm Bureau Federation’s Tony Seegers. Craig Vandervoort of Sitterly & Vandervoort Ltd. will present on Medicaid and nursing home planning for family farms. Robert Moore of Wright & Moore Law Co. will moderate a session featuring an OSU Extension Educator and an insurance agent on agri-tourism and direct marketing trends and liability. A roundtable discussion on guiding clients in today’s agricultural climate, moderated by Troy Callicoat of Barrett, Easterday, Cunningham and Eselgroth LLP, will wrap up the day. A special highlight of this year’s conference is a bus tour of OSU’s Waterman Farm. The bus will then take conference attendees to the North Market in downtown Columbus for lunch and a discussion with North Market Farmers on legal issues and challenges they face. Law students interested in attending the conference may apply for student scholarships provided by the Paul L. Wright Agricultural Law Endowment Fund. Contact Caty Daniels at daniels.498@osu.edu for scholarship information. For more information and to register for the conference, visit www.regonline.com/OhioAgLaw. Should your Agricultural Business Consider a Non-Disclosure Agreement? Attorneys across Ohio recently came together for the 2013 Ohio Agricultural Law Symposium to learn about current legal issues for Ohio farmers and agribusinesses. In a session about protecting the farm and agribusiness, Cari Rincker, a food and agricultural law attorney in New York City, discussed why farm and agribusinesses might consider using a Non-Disclosure Agreement (NDA) to safeguard confidential business information. An NDA is not typically a tool that a farm or agribusiness would think of using in a business transaction. According to Rincker, however, NDAs are underutilized in the food and agriculture industry. Many farms and agribusinesses develop their own ideas, concepts, know-how, trade secrets, intellectual property, business plans or financial information. Preventing other parties from disclosing these types of information can be important to the long-term health and viability of the farm or agribusiness. Rincker highlighted two common situations for using an NDA. One is when a farm or agribusiness is entering into business discussions with another party; confidential information could be disclosed during the course of these discussions. For example, if a farmer approached a website developer about his or her proposed online agribusiness, that farmer may wish to have an NDA with the website developer to keep the business plan confidential. The second situation concerns employees or independent contractors. An NDA binds employees and contractors to confidentiality about private information they acquire from working for the business. An agribusiness may want a bookkeeper to maintain confidentiality about business finances, for example. Who will be exchanging confidential information? What is the purpose of the exchange of confidential information? What type of information will be considered “confidential” for purposes of protection under the NDA? How can the confidential information be used and who can use it? How will the secrecy of the confidential information be maintained? How long will the confidentiality of the information be maintained? What are the consequences of a breach or misuse of the confidential information? Maintenance of confidential information should not be taken lightly, states Rincker. If your farm or agribusiness could be harmed by the disclosure of private information, talk with your attorney about an NDA. For more information on NDAs, visit the Rincker Law website and blog at http://rinckerlaw.com/blog/. 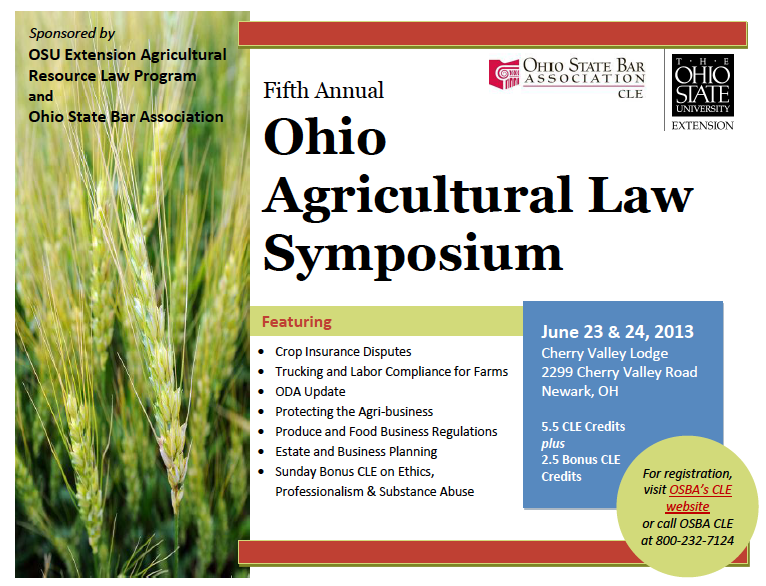 Ohio State University Extension and the Ohio State Bar Association will again partner to host the fifth annual Ohio Agricultural Law Symposium on June 23 and 24, 2013. The focus of this year's program is representing Ohio's farm and agri-business clients. Two nationally respected practitioners will teach for the Symposium. Allen Olson from Albany, Georgia, who has farm clients throughout the southern states, will provide guidance on representing farmers in crop insurance disputes and will also share his outlook on federal farm bill policies. Cari Rincker of Rincker Law Office in New York, NY, whose client base is spread around the country, will speak on protecting the farm client’s business by managing contracts, intellectual property and employment concerns. The program will also include Ohio legal experts on labor, trucking, food safety and estate and business planning. Leah Curtis from Ohio Farm Bureau and Roxi Liming with Adams, Liming & Hockenberry, LLC in Columbus will use a case study approach to discuss advising farm clients on trucking and labor regulations. Russell Cunningham and Jeff Easterday of Barrett, Easterday, Cunningham & Eselgroth, LLP will present on estate and business planning for farm clients, and advising clients on recent food safety regulations will be presented by our own OSU Extension Agricultural & Resource Law Program. An update from the Ohio Department of Agriculture will feature Deputy Director John Schlichter. New this year are changes to the location and timing of the Symposium. The conference will be held at Cherry Valley Lodge near Newark, Ohio, and will begin on Sunday evening with a bonus 2.5 hour CLE session on Ethics, Professional Responsibility, and Substance Abuse. Ethics and substance abuse topics will be delivered via video replay and speakers Allen Olson and Cari Rincker will cover the professionalism component with strategies for developing and retaining farm and agri-business clients. The Sunday session will conclude with a social reception. Also new this year, the Ohio State Bar Association Agricultural Law Committee will meet on Monday morning. Law students interested in attending the Symposium may apply for student scholarships provided by the Paul L. Wright Chair in Agricultural Law Endowment Fund at Ohio State. Contact Peggy Hall at farmoffice.osu.edu for scholarship information. To register for the Symposium, visit the Ohio State Bar Association Continuing Legal Education website at www.ohiobar.org. View the complete Symposium brochure on the OSU Extension Agricultural & Resource Law website. Larry Gearhardt of Ohio Farm Bureau Federation received an AALA Excellence in Agricultural Law award. Peggy Hall of The Ohio State University was inducted as the AALA’s President Elect. Nashville, Tennessee is the site of the AALA’s 2012 conference, which will take place October 19-20. For more information on the AALA, visit http://aglaw-assn.org. Ohio State University Extension and the Ohio State Bar Association will again partner to provide the third annual Ohio Agricultural Law Symposium on September 17, 2010. The continuing legal education event targets the educational needs of attorneys who work in agricultural and rural arenas. Ohio Supreme Court Justice Paul Pfeifer leads our slate of speakers; he'll provide an update on relevant case law impacting agriculture. Joining the Justice will be Jesse Richardson, Assoc. Prof. from Virginia Tech and Policy Advisor for the Water Resources Council, who will address water law and ethics in counseling farm families. Duane Siekman, CEO of the Ohio Corn Growers and Ohio Wheat Growers Associations, will present on energy and agriculture, and Tony Logan, Ohio's USDA Rural Development State Director, will provide an update from his office. The local food and farming landscape, a growing practice area for agricultural and rural attorneys, will be the topic of discussion from Jill Clark with OSU's Center for Farmland Policy Innovation. Attorneys Robert Moore and Dave Pennington of Wright Law Company will present on proving damages in agricultural litigation, and attorneys David Pryor and Greg Flax will lead a panel discussion on growing the agricultural law practice. I'll provide a presentation on the legal issues attendant to undercover operations on the farm. The Symposium will take place at The Ohio State University on the Friday before an Ohio football showdown between OSU and Ohio University--attorneys can come for the education and stay for the game. For more information, visit the Ohio State Bar Association CLE link at http://www.ohiobar.org or click here for the Symposium Brochure 2010.